The eco energy plus UPVC window is a highly energy efficient and environmentally friendly UPVC window, and is available from BAL Glaze. The eco energy plus window features a 6 chamber system that provides better insulation, strength and acoustic performance. 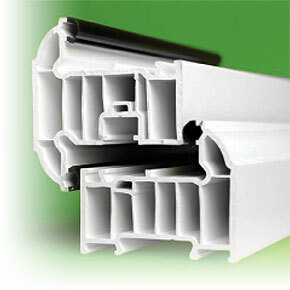 The profile construction made from 100% lead free PVCu. 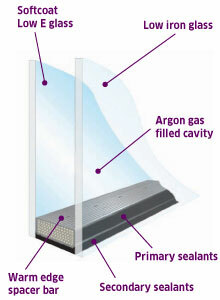 Bubble gaskets give an enhanced weatherseal - less chance of warmth escaping and no noisy drafts. Hinge screws installed through two walls of thick PVCu for added security and strength, unlike other systems. The eco energy plus window system has achieved a BFRC (British Fenestration Rating Council) Window Energy Rating of 'A', the highest achievable. The eco energy plus window system uses it's multiple chambers to lock in the heat, and high performing bubble gasket seals to ensure there are no gaps for heat to escape. Reduces conductive and convective heat transfers. Up to 80% of energy loss through a window can occur at the edge. Conventional aluminium spacer bars conduct heat out and cold in, and have exceptionally high thermal energy loss. Using a warm edge spacer bar will reduce heat loss at the edge of the window by up to 94%. Double glazed windows fitted with warm edge spacer have an internal temperature of up to 65% warmer, reducing condensation on your sealed unit by up to 70%. This reduction in moisture virtually eliminates the chance of mould growth and potentially harmful bacteria. A transparent metallic coating reflects heat back into the room. The coating also allows heat and light from the sun to pass through the glass, warming the room, adding to the efficiency of your windows. The low iron content produces a higher light and energy transmittance.